When David Cole was first writing Enemy Aliens, in the immediate aftermath of 9/11, the anti-immigrant brand of American patriotism was at a fever pitch. 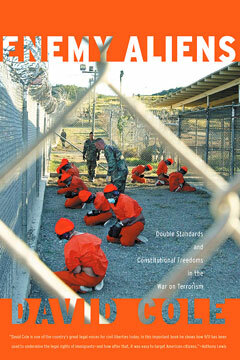 Now, as the pendulum swings back, and court after court finds the Bush administration’s tactics of secrecy and assumption of guilt unconstitutional, Cole’s book stands as a prescient and critical indictment of the double standards we have applied in the war on terror. Called “brilliantly argued” by Edward Said and “the essential book in the field” by former CIA director James Woolsey, Enemy Aliens shows why it is a moral, constitutional, and practical imperative to afford every person in the United States the protections from government excesses that we expect for ourselves.